Archaeologists have uncovered one of the oldest temples of America in El Paraíso, a rich archaeological site located 40 km northwest of Lima. The pyramidal structure is estimated to be c. 5000 years old (although awaiting radiocarbon dating), much much older than the Incas and rather contemporary of the pyramids of Egypt, for example. 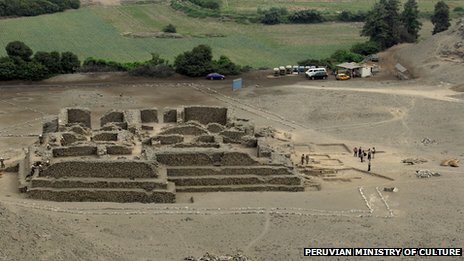 It confirms that the area of Lima was a ceremonial center for the ancient peoples of Peru. The Temple of Fire, as it was nicknamed by the discoverers, contains a hearth at its center, which they suspect was a key part of their rituals. It is built of stone covered in fine yellow clay, which shows some indications of having been painted in red colors. The ritual site is located close both to the coast and to the valley, allowing for it to interact with both the coastal fishing economy and the beginnings of agriculture in the interior, they say. The prehistorical period of this building is known as the Pre-Ceramic Age (c. 3600-1800 BCE). Sources: BBC, El Universo[es] (via Pileta). Update: see the interesting comments below by Raimo Kangasniemi, who argues that several sites (Áspero, La Galgada, Caral, all them in Peru) are roughly contemporary of this one, indicating a growing dedication of resources to ritual/religious buildings already in the Pre-Ceramic Period V, also elsewhere.